A few weeks back we lost a friend to a vicious and unsmiling assassin – depression. Jason Mumford was known throughout the region as a bright and bubbly personality, he was a father, a partner, a brother and a son. He hid his illness well. Alas, he was far from alone – many of us have lost loved ones, relatives, colleagues, acquaintances, friends of friends, young and old in similar fashion. Mental health issues are indiscriminate, debilitating and sometimes fatal. The Lennox Head Golden Oldies decided to draw a line in the sand. The Stags (as we are fondly known) are an eclectic bunch of ‘never have beens’ who play touch in a very mediocre fashion and who can raise money for good causes when we really, really put our minds to it. So… after a long discussion we decided to put on a function to raise awareness and money for mental health causes and to make a difference. The result is Are You Brave Enough…? at the Beef and Balcony on November 2nd. It promises to be a relaxed and friendly event in a stunning location. All with a serious message – Are You Brave Enough…? 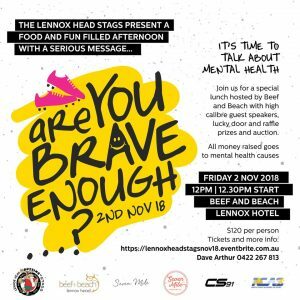 Stellar speakers from the sporting world are jostling to talk, there’s a local comedian, stories to be shared and laughs to be had, raffles aplenty and of course, an auction. Throw in some of the best food and beverages from around the region and you get the picture! other ideas that you can contribute to. Male or female, old or young, short or tall… we want YOU there! Simply head to this link Are You Brave Enough? 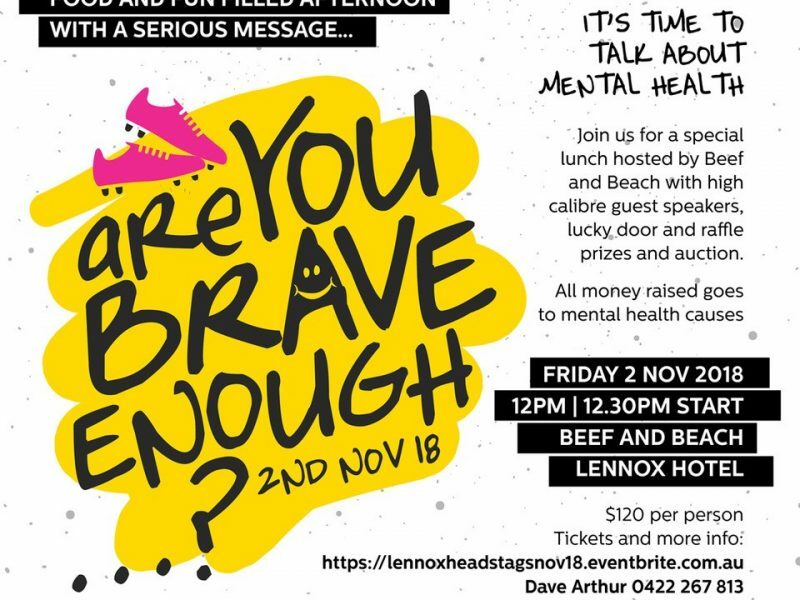 to buy your tickets or to donate or give Dave Arthur a call on 0422267813 to discuss. Please help spread the word and forward this email to anyone you feel may be interested. Thanks!